I had an exciting moment this past week. Driving home after hiking with my husband, we saw a bobcat cross the highway. Wow! What a rare opportunity. Luckily there was a place for us to pull over. I jumped out of the car and saw the big cat immediately. Usually they're very hard to spot because they have camouflage down to a fine art. 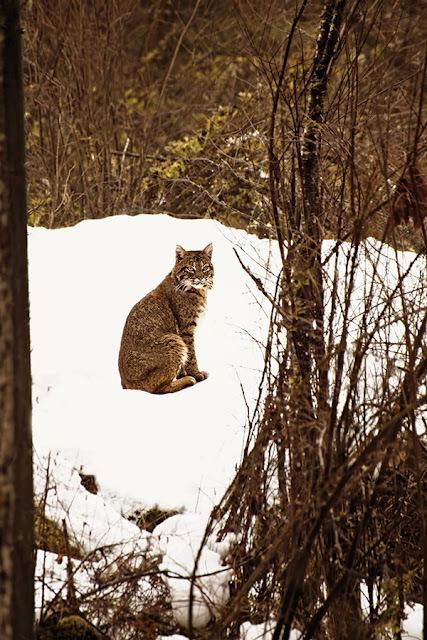 In this case though the bobcat was easy to see against the snow. After walking a few steps, the bobcat obliged me by sitting down and checking me out while I took his portrait. At one point I looked away to get a better footing. When I looked back, he was gone. I looked and looked but couldn't see him. I walked a few steps back to the car and was just about to get in when I saw him move. He'd stepped into the nearby brush and had become invisible. At that point he leisurely moved off and was swallowed by the forest. The whole experience was one I'll never forget. Something happens inside of you when you see a wild animal in its natural habitat.